Figured it was time for a farm update. All is going well here. The watermelons have grown even bigger since I took this picture! We cut into one, but we were just a few days too early - it was nice and pink, but only in the very center. We ate that part and gave the rest to the horses. Horses just LOVE watermelon rind! A word to the wise - watermelon takes over your rows, your plants, your garden, the world outside your garden....well, you get the point. Selfish little vine. Tomatoes have been slow, but it does look like we are going to have some, finally! I also tried a tomatillo, but it wasn't quite ripe yet either, so we're waiting a bit more on those. Paul and I are have dreams of salsa verde. Our teenagers are still thriving. They have toned down the mohawks - just a tiny bit. See. 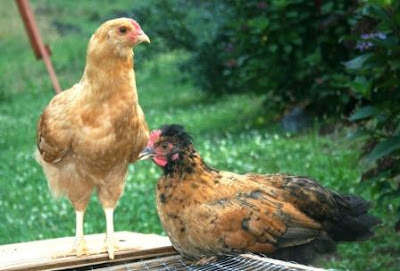 Rebellious chicken pictured on the right brushed down his mohawk for the picture. He didn't want ya'll to think badly of him (her?). Canned pickles for the first time! See that big jar in the middle? Alas, it didn't make it. But all the others did. Letting the pickles cool on the deck outside. I use the word "cool" lightly, as it was 97.5 degrees outside, so they weren't exactly doing much cooling. I was worried the pickles would not taste right or would be too squishy, but they turned out crisp and tart and delicious! And finally, my favorite veggie recipe of the week - zucchini casserole! This was a HUGE hit w/ the family - I found it on Amish Stories Blog. I used ground turkey instead of beef and red pepper instead of green pepper, and I halved the amount of cheese suggested. It has a wonderful taco flavor and I'll definitely make it again. This post is linked to WV Treasures Tuesday Show and Tail. How does your garden grow this week? Is it surviving the heat? You pickles sitting in the sun look wonderful! 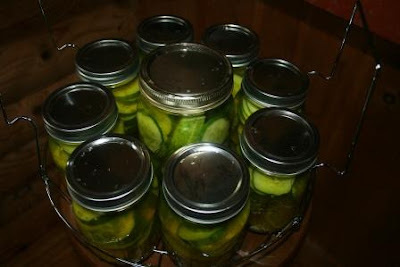 I love the picture of your pickle jars "cooling". 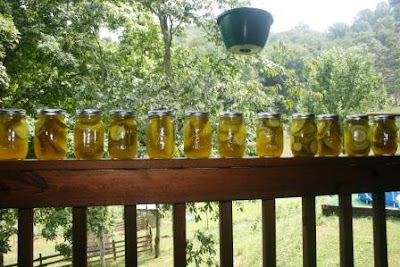 Years ago, I canned and made pickles. Always loved to hear the "POP" of a canning jar! Good job with the pickels! I also love the picture of them cooling. I liked your images Lisa, and from the sounds of it you know your way around the kitchen. Unlike myself who acts like a blind folded bull when inside the cooking area. Richard from Amish Stories. Love the pics of the pickles. Very pretty! We didn't do a garden this year and we are glad we didn't. Nothing is surviving this heat and lack or rain. Heading over to check out that recipe too. Love ground turkey! We use it instead of beef all the time! Loved the chicken pics, and the pickles! And yes...watermelon will take over everything! Love your little chickies also. Those pickles look good and my zucchini is now crazy in production. I will need this casserole recipe. Love it...your garden is amazing. I hadn't canned pickles in at least 2 decades - but I did this week! Wish I had some of your selfish watermelon vines. Hopefully, next year! I loved your teens! I bet they listen as much, too! Yesterday, we went blueberry picking. Now I want 5 blueberry bushes of my very own for my birthday!!! Keeping my fingers crossed! 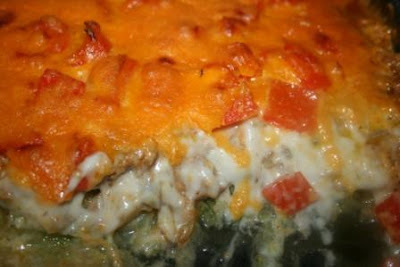 That casserole looks delicous!! Yum! I made pickles once but they were mushy-I think I used the wrong kind of salt. I need to try making them again. Your garden looks great! We've had cooler weather than normal so our garden is way behind. Hopefully we'll start getting tomatoes one of these days. I'm going to try that casserole! Seeing your photos I miss my Midwestern garden! Living in AZ means learning a new way to do something I have done all my life. 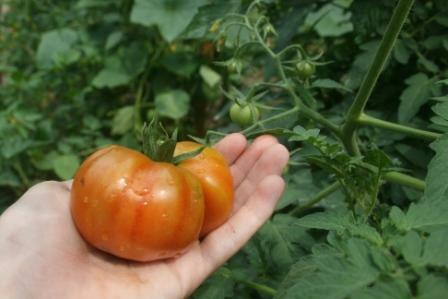 The big beefsteak tomatoes I was trying to squeeze a few more days of ripeness into COOKED on the vine last week. LOL Now I have none. We do get 2 planting seasons so I have learned my lesson. Your pickles look amazing. Looking forward to seeing and trying more of your recipes! So, I'm definitely making that zucchini casserole this week! We have a plethora of zucchini right now. Your chickens and garden all look so healthy! You are staying so busy even in this heat...love the pickles on the railing picture! Can you tell a difference between your eggs and ones from the supermarket? I have done several tests for my blog and have read a few articles on it. Liv and I love the chickens! In this crazy heat, I had to giggle at "cooling!" Wow! 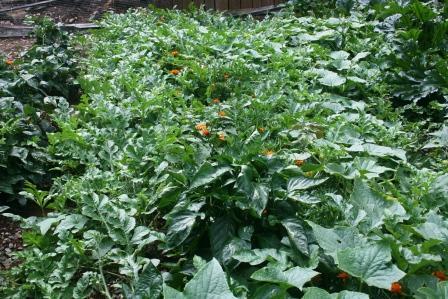 I am so jealous of your awesome garden, your canning abilities, and your cooking!! You rock! The watermelon looks amazing! I'm jealous! and I had no idea horses liked watermelon rind!.. have never even tried to offer it. Seeing your photos makes me miss our garden!! We just moved into a new house (well, 6 months ago!) so we decided to take a year off from the garden this year. I'm in Japan so I've eaten Japanese food for 2 weeks now so that zucchini casserole is the best thing I've seen in 2 weeks!! YUMM!! Beautiful garden! We have tomatoes, but the watermelon haven't done a thing. I think it has been too dry for them. Your pickles look so pretty sitting in a row. i want to visit you. just for the experience of vines and chickens. i invite myself to wherever i want to go. also. i'm impressed with your mad gardening skillz. for real. I love the pic of the pickles all lined up. I can almost taste them! You've been busy! All that canning and cooking home made foods! You are making me look bad! lol I've never made pickles but my kids don't really eat them that much. Mom used to can pickles and they were good. If you achieved crisp pickles-you did good. It's hard to do. Have you ever done up zuchinni relish? We won't eat pickle as long as we have zuchinni relish! Sure hope it cools down for you soon. I want to try and can pickles this year. I'm just not sure if I'll have enough cucumbers to. I have put up several jars of jelly this year. 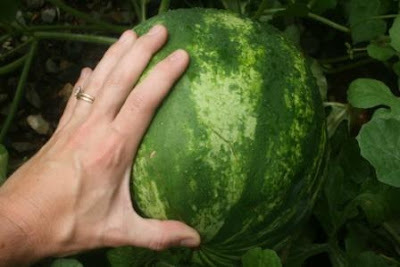 I'm in awe of you growing watermelon--I have always tried and always FAILED! Yay for the tomatoes and success with the casserole and pickles. Oh yum, that looks SOOOO good. Can I have some, please? ;) Pretty please? I hope you refrigerated the non-popper. :) Great work, Lisa. 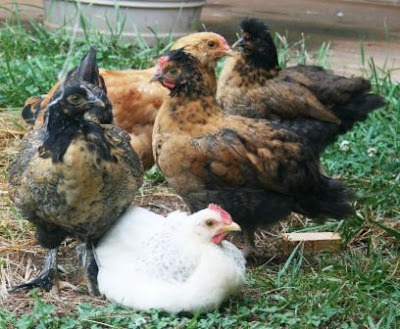 Love the looks of your chickens. I am getting some pullets in another week or so. Looks like your garden keeps you very busy. I am sure your family loves the fruits of your labor once winter sets in. Your pickles look delicious!! And so beautiful all lined up with the light shining through the jars.